Time for... Monday Mega #MailCall part one! 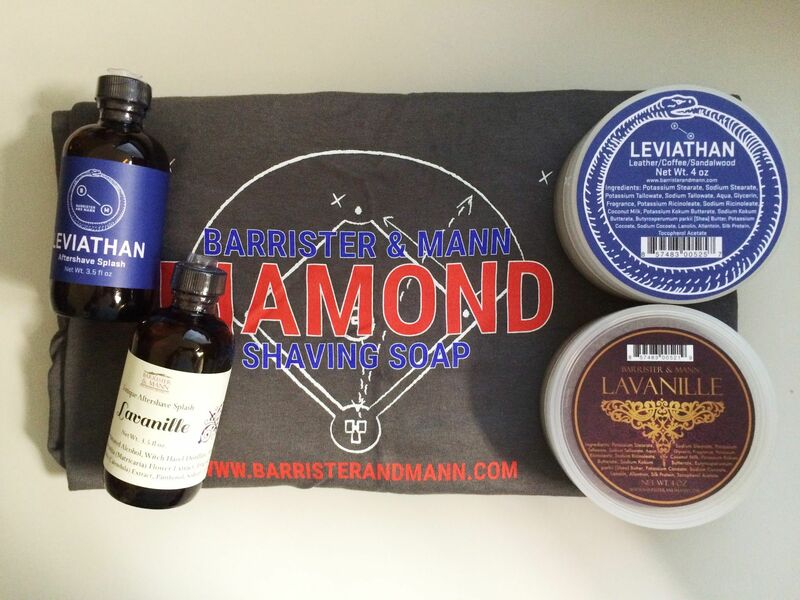 First up we have Barrister and Mann Lavanille & Leviathan #soap and #aftershave! The products came in the typical (current) #BarristerMann packaging; clear tubs and squat round bottles. Each was very nicely labeled - you'll note Leviathan is of the new style and logo, whereas Lavanille is still the older type. Either way, they look professional. Lavanille - The scent is basically a smoky, leathery cedar with lavender and vanilla notes. Musky and dark - yet sweet... The cedar and vanilla come in towards the mid notes especially. On the base it's more of a leathery tobacco. Quite unique. Leviathan - This scent is leather, coffee and sandalwood. I definitely get the coffee and leather up front; a nice, somewhat "older" leather - like a fine old chair or jacket. The sandalwood is more of a backdrop and rounds out the scent nicely. As it dries down, the sandalwood pops a little while the coffee takes a backseat and blends with the leather. A very masculine scent. Love it! This could easily be "mistaken" for a high-end cologne. The scent strength on both is pretty potent - especially the soaps, woof! The Leviathan aftershave dries down to a subtle level... Lavanille a bit stronger. Maybe because it's somewhat unique, it stands out a bit more as well. See my SOTD and review of Leviathan and SOTD and review of Lavanille for more details.